Women of Cisco, Citrix, EMC, Intel come together on Thursday 17 January 2013 at Cisco Systems in San Jose, California, for the first of three “unconferences” to build professional relationships across technology companies. Each firm has an Employee Resource Group (ERG) focusing on career development and advancement for women in technical and non-technical roles, and each recognizes the value of building cross-organizational business networks and relationships. Women of Intel (WIN) has been a leader by hosting annual events that bring together women from other local technology firms, and occasional efforts have brought together women from Google, Applied Materials, EMC, Intel, Yahoo, Cisco, IBM, Hewlett-Packard, Citrix, Symantec, Adobe, and other Silicon Valley technology companies. 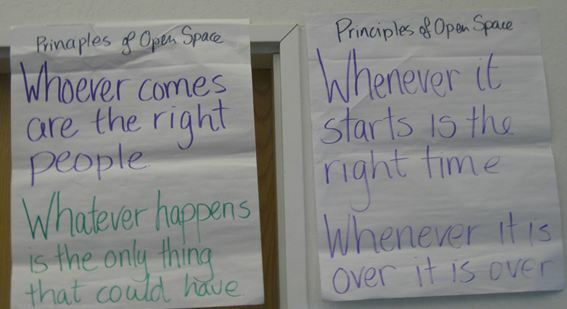 In 2012, EMC and Cisco collaborated on an event designed to encourage longer-term relationships through small-group discussions of a talk by the versatile Marylene Delbourg-Delphis, serial tech entrepreneur, philosophy professor and fashion journalist. Anna Van Rijswijk of Cisco, member of the EMC-Cisco planning team, expanded this concept to a multi-session series and incorporated a “Birds of a Feather” format, developed by the Internet Engineering Task Force (IETF) to denote initial meetings of members interested in a particular issue. The goal of the multi-company, multi-session “Birds of a Feather” networking event is to increase insight and resource-sharing on topics crucial to professional women’s career advancement in technology firms, while establishing and developing stronger cross-company resource networks. Upcoming sessions in the spring of 2013 will hosted onsite at Citrix, EMC, and Intel, and will continue these themes. -*How do you expand your professional network across companies in your industry and across professional roles? This entry was posted in Business Communication, Career Development, Personal Brand, Working Women and tagged Adobe, Anna Van Rijswijk, Applied Materials, Birds of a Feather, Cisco Systems, Citrix, EMC, Google, Hewlett-Packard, Intel, Internet Engineering Task Force, Marylene Delbourg-Delphis, Olivia Shen Green, professional network, professional women, Silicon Valley, Symantec, Unconference, Women in Technology Forum, Yahoo on January 16, 2013 by kathrynwelds. great visuals in this post Kathryn! Sounds like you had a fabulous time. I’m sorry I missed this one but am looking forward to the next! Thanks for sharing! Thank you for stopping by, Jennifer, and for your comments. 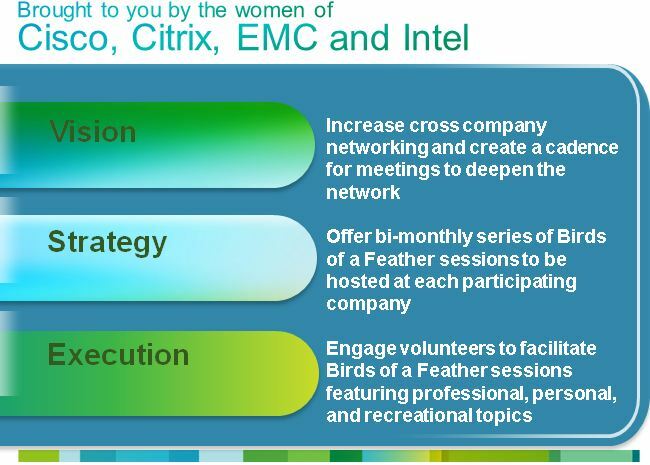 “Birds of a Feather” format will be featured in Cisco’s 2013 Women in Technology Forum, 27 March 2013 in San Jose, California. This event showcases professional development, work-life solutions, and technical innovation topics in facilitated discussions. 19 January 2013 blog post shares more details.